The metropolitan is a classic single barrel twist pen. It's the perfect size for all around everyday use. 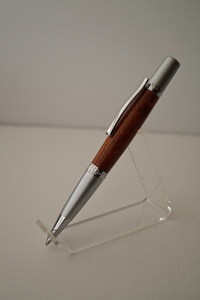 Subtle elegant accents adorn the pen, clip, nib, and finial. The pen accepts a parker style refill for a smooth optimal writing experiance. The satin chrome finish pairs beautifully with the mesquite burl. The mesquite was obtained from Austin, Tx. This pen is a true classic.